Yesterday was like any other day until I read our Quality Policy again. The word ‘customer delight’ caught my attention. And the immediate reaction was – when did anybody ever get up in the morning and think “Cool! A new day for upsetting customers”. Apart from the Devil himself, No body. Customers awarding me 10 must be delighted. Customers giving me 8 must be satisfied and the blank entry, I would say they are not loyal. Satisfaction – the contentment one feels when one has fulfilled a desire, need, or expectation. Delight is, to take great pleasure when your expectations are exceeded. Loyalty is having the feelings of allegiance. These three simple words have a slightly different meaning, but all have a significant impact on the attitudes and behaviors of customers. Clearly, satisfaction is the minimal requirements to play – to truly develop a loyal or at least a return customer, one must go beyond satisfaction to delight. When I was a little girl, I used to get upset whenever I had any fights with any of my friends. I would show tantrums and skip dinner. It was my dad who took me out for walks for soothing and yet wise words. Being an obedient daughter I used to listen to him carefully and absorb all that. In return he always delighted me with a candy bar. I never had expected that. Same is with our customers. Customer expectations are typically not very high. Give them 2G they are happy unless and until they know about 3G. Our job is to surprise them with what they were not even expecting. Now the question that arises is – how do we do that? The NPS scores , the perfect 10s, respectable 8 and a blank entry made me think about this golden rule , (on second thoughts, looking at the gold prices today) let me call it a Platinum rule. DAD 🙂 yes inspired from my DAD , my hero. 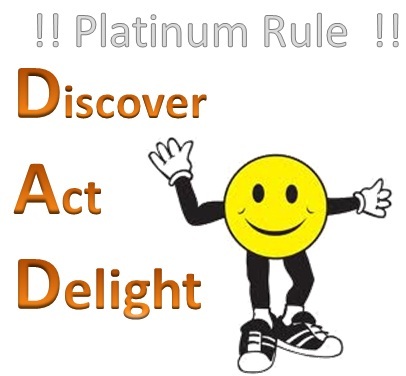 DAD stands for Discover Act and Delight. Discover – Whenever you want to delight your customers you will have to first discover their expectations or needs. Only then will you be able to fulfill them or exceed them. Now how will you sense your customer’s expectations; clearly it is not an easy task. You should always strive to cultivate your dynamic sensors that will help you discover them clearly. Pay attention to your clients’, they give you various hints via mails, on phone calls. If somehow it doesn’t work, then it is the time to change the shoes , be the customer of your own business. This will help you identify where your business is falling short on creating customer delight. Do you serve your customers with an A* attitude? Or do you service them like YOU are doing them a favor? Act – you got the customer’s expectations. It is time to act on it, not just to fulfill it but to exceed it. Service industry is a competitive world. You need customers to return with business. What you will do then? Give them options, that way it’s easy for customer to decide want they want and what they don’t rather than leaving them wandering. Think what else you can provide them! Delight – Inform customers of your intent to evoke customer delight. Asking help actually strengthens the bond, it does not weaken it. Make this message a part of your campaign from the very beginning. And when you achieve it make sure it is acknowledged. Customers may not know what exactly they want but they have a pretty good idea of what they like and dislike when confronted with it. Take advantage of that. You might learn something. My dear warriors of the service industry, a bit of engagement, a bit of loyalty, a bit of consumer delight is all that we want. 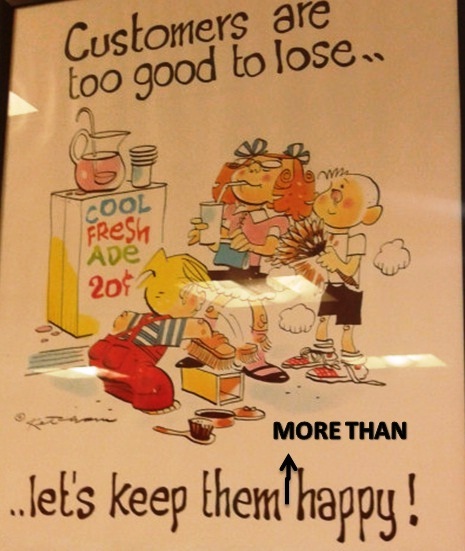 Customers are too good to lose, let’s make them (^ MORE THAN) happy. PS : This is my toastmasters 7 th project , which I also delieverd in International Speech contest and won second position.